What we might expect for diffusion of new decentralized energy technologies? Technologies and policies that enhance the development of decentralized energy resources have generated increasing interest over the last couple of years. I’ll write more in the future about what are the underlying drivers, both technological and institutional. I’ve been interested in the question of where do we stand, and how long might it take for diffusion of these new technologies. We can look back and see how technology transformed lives in just a couple of decades. Compare kitchens from 1900 and 1930; if we walked into the earlier kitchen, most of us would be lost, but we could whip up a meal in 1930. Do we stand today at a point just at the onset of a new technological evolution? One question to be answered is whether our institutional settings will allow these new technologies. In one case, it appears that Germany has already chosen its road. But in the US, whether we rely on central power stations using transmission lines may still be a question in play. That deserves a separate post of its own. 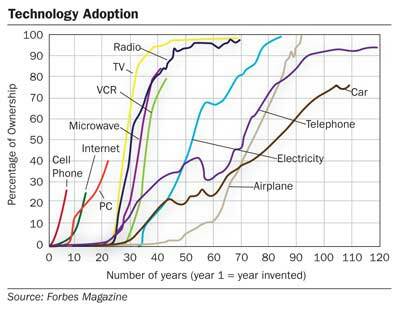 One might interpret the upper graph as showing accelerating adoption rates. But I interpret the lower chart as illustrating at least two factors that drive diffusion: the relative importance of network infrastructure and the expense relative to individual wealth. 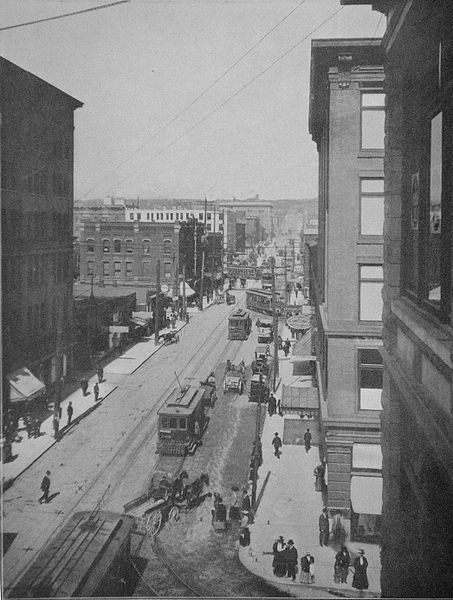 Autos, telephones and electricity all required construction of a large network of roads or wires, often funded with public investment. Individuals can’t choose to adopt the technology until a larger public decision is made to facilitate that adoption. As to expense, refrigerators and dishwashers were large household investments for many years, and cars are still a large single expenditure. On the other hand, cell phones, radios and televisions quickly became inexpensive which lubricated diffusion. We need another graphic showing how diffusion rates relate to these two different axes. We are still unsure where decentralized energy technologies will fall among these characteristics. They may seem small and inexpensive, but enough solar panels to power a house will still be several thousand dollars for the foreseeable future. And the how much electric network investment is required to integrate these resources is the center of the debate over technology policies. Too often studies making forecasts and policy recommendations don’t consider what adoption rates are feasible or probable. However a study comes along and incorporates this concept as its centerpiece. A good example is the Clean Energy Vision Project’s Western Grid 2050 report. Lead by a former colleague Carl Linvill, who’s now at the Regulatory Assistance Project, it looked at several different scenarios for technology diffusion. Such studies give us a better understanding of what’s actually possible rather than what we wish for. This entry was posted in Energy innovation and tagged alternative energy, climate change, energy management, energy resources, innovation policy, M.Cubed, technology subsidies, zero net energy on July 29, 2014 by mcubedecon.